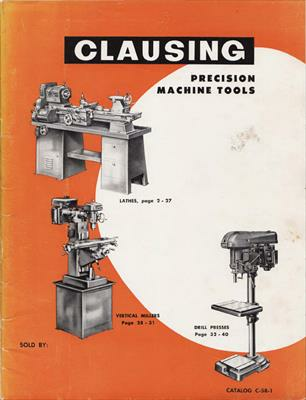 Publication Title: Clausing Precision Machine Tools, Catalog C-58-1 Clausing Div. of Atlas Press. Art, contents nearly identical to Cat. C-57, changes noted pp. 21, 26, 39. Pub. ID C58-1-12587.